I’m wrapping up my two-month summer roadtrip, my buh-bye to the previous slipping-and-sliding year (no, not that fun slip-n-slide) in the Outer Banks of North Carolina. I’ve pulled myself away from the beach, past the ice cream shacks and eh-alright BBQ joints, to finally do some laundry, as I’ve ran out of tank tops. I’ve packed my washers and a lady has maneuvered a shopping cart into the laundry mat, this lady wearing the world’s coolest pants, a mix between denim overalls, a handkerchief, and grandma’s quilt. She gives me laundry soap powder, says she thought I could use it. A man, who kind of looks like he would be friends with my dad, keeps popping his eyes out at me, trying to read the cover of my book, eyeing my case of beer. And I spy right back, at his beach t-shirt (you know the difference between wearing the t-shirt for the beach you’re at vs. wearing a t-shirt for something else), at his bald eagle tattoo, at the way he says four words to his wife, reading a romance novel, the hour we share the space. The four of us deal with the machines, the clothes, and the soap, rotating our views between each other and our machines and some text–my book, the awaiting fabric softener box, the instructions we all know on the coin machine, a story about some other broad-shouldered guy on some other beach, each of us peering into each other’s world, into other worlds, out of our own. 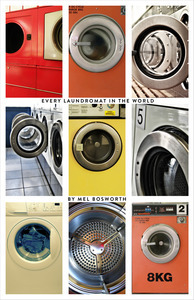 That’s how it is reading Every Laundromat In The World by Mel Bosworth, the newest beauty from Safety Third Enterprises. These poems are tiny slices of life, no more than peering, no more than itty-bitty in their brevity, but those moments show something bigger cupped in the pages. And reading those words, I’m back at that off-shore laundromat, the not-mine machines having stopped their spinnings, all clean now. I see these poems inside there, the stories inside the pink bra, the places these other people have been wrinkling on a t-shirt with each stopped second. In these short poems, Bosworth bounces between narrative details and weird fortune cookie wisdom, unfolding bits about “the man” and “the woman,” showcasing the beautiful in the pieces–isolated, given, allowed to be seen. The crisp poem illuminates what makes Bosworth’s style so precise, so massive, so complete; there is nothing more to say about this leaving behind, this cruel (for all parties) evening, that wasn’t already said. And not to keep kicking at a theme of the book galloping in the goodness pasture, but this chapbook seriously shines as a whole, when all those slices come together, articles of clothing in a wardrobe. Each piece on its hanger, the closet door shut, the book closed, finished, I find myself like the man in “Photograph From Five Years Ago,” each time, the whole time, forever in recollection of Mel Bosworth’s fine work, with my head all out-of-whack as if I’ve “seen or heard something/surprising or revolting.” It’s hard to tell which.